Introducing The Kane Ancestral Map of Ireland, an Irish family map of Ireland that provides the history, roots, and genealogy of over 760 Irish families. This richly colored, superbly detailed map is easy to use. Irish family names are listed in their original Gaelic spelling and are indexed alphabetically along the edges of the map. After each name is a key that identifies the county or counties in which the irish family lived. Our Irish Heritage map further reveals the baronies in which each irish family held power, designates the irish families traditional social position under ancient Ireland's Brehon laws, and includes an in-depth genealogical flow chart that will help identify where in the Royal Lineage of Ireland each family originated. We invite you to read the intriguing history of how the map was painstakingly researched and created, as well as view the map sample. We have also included a brief tutorial detailing how to use the map, and a complete list of the ancient irish gaelic family names that the map represents. The Kane Ancestral Map of Ireland will provide you, your family, friends and relatives with years of enjoyment as one uses the map to trace their irish genealogy and irish ancestors. 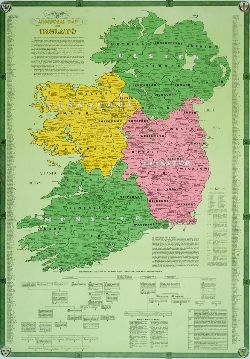 The Kane Ancestral Map of Ireland makes the perfect personal or business gift. See for yourself if your family descended from ancient Irish Royalty!